To know more about Koh Samed, click Map of Koh Samed. - Where is each beach located? - How can we get to Koh Samed? Samed or Samet was named after the Samet Tree or the cajuput tree that grows everywhere on the island. It was declared ‘Khao Lam Ya – Samet Archipelago Maritime National Park’ in 1981. The park encompasses Had Mae Rumpueng-a beach on the coast of Rayong, Lam Ya Mountain and the Samet Archipelago that consists of Koh Samet, Koh Chan, Koh San Chalam, Koh Hin Khao, Koh Kang Kao, Koh Kudee, Koh Kruoy and Koh Plateen. An ecological tour can be conducted through three itineraries on Koh Samed, Koh Kudee and Lam Ya Mountain. Samet Island, Or Koh Samed in Thai. Some may call Koh Samed, instead of Koh Samet, what an idyllic island ! Once upon a time..
“Sunthon Phu” (Thailand all time great poet), had described about Koh Samet as “Koh Kaew Pitsadan” (Koh = island, Kaew = glasses, Pitsadan = magically) in the best of his romance poems “Phra Aphai Mani”. He want us to know how wonderful this white sandy beaches is ! “Phra Aphai Mani”is about a lovelorn giant - she is broken-hearted and dies on the crystal sandy beach of the island. 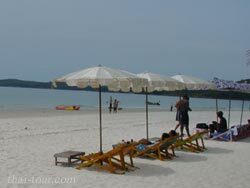 Even though you won't see her remains anywhere on Koh Samet, but you're sure to see its crystal white sandy beaches, especially on the Had Sai Kaew or Sai Kaew Beach. Koh Samet was named after the Samet Tree or the cajuput tree that grows everywhere on the island. It was declared ‘Khao Lam Ya – Samet Archipelago Maritime National Park’ in 1981. The park encompasses Had Mae Rumpueng-a beach on the coast of Rayong, Lam Ya Mountain and the Samet Archipelago that consists of Koh Samet, Koh Chan, Koh San Chalam, Koh Hin Khao, Koh Kang Kao, Koh Kudee, Koh Kruoy and Koh Plateen. An ecological tour can be conducted through three itineraries on Koh Samed, Koh Kudee and Lam Ya Mountain. For more information, contact Khao Laem Ya and Mu Ko Samet Nation Park Office by Tel: + 66 3865 3034, from 8.30 a.m. to 16.30 p.m. Located in the “Gulf of Thailand” (the eastern ocean), under the management of “Baan Phe District” of “Rayong Province”. For your information, Rayong is famous for its abundance of fruits and sandy beaches, far approximately 220 km from Bangkok. Baan Phe is the seaside town, located approximately 19 km southeast of the city, Baan Phe is the best place to enjoy relaxing on a long white sandy beach while sampling sumptuous seafood. Baan Phe is a major fishing community in the province, hence, the wide range of fresh and preserved seafood products or other local products. In addition, Baan Phe is also the departure point for Koh Samet which is far around 6 km from the coast of Rayong province. Copyrighted and managed by Thai Tour Info Co., Ltd.